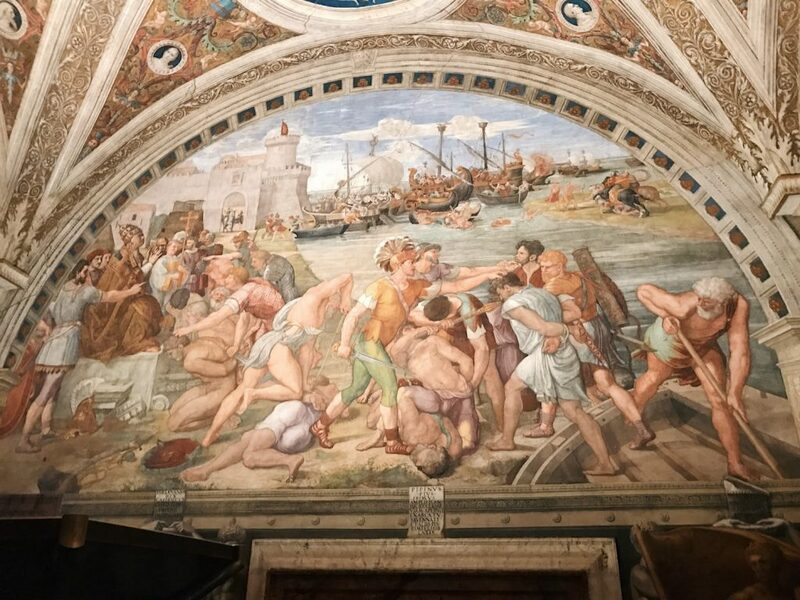 Raffaello Sanzio and helpers, Fire in the Borgo, Stanza dell'Incendio di Borgo, fresco painting, ca. 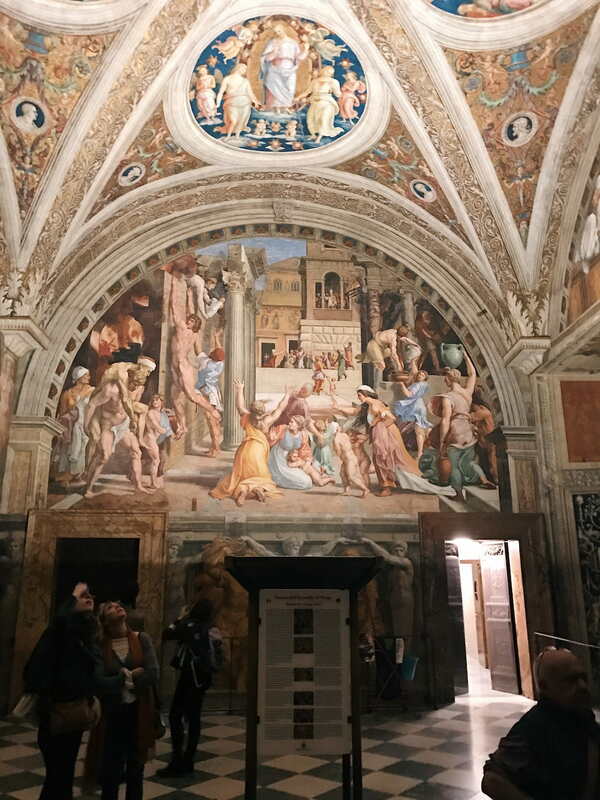 1514, Vatican Museums. 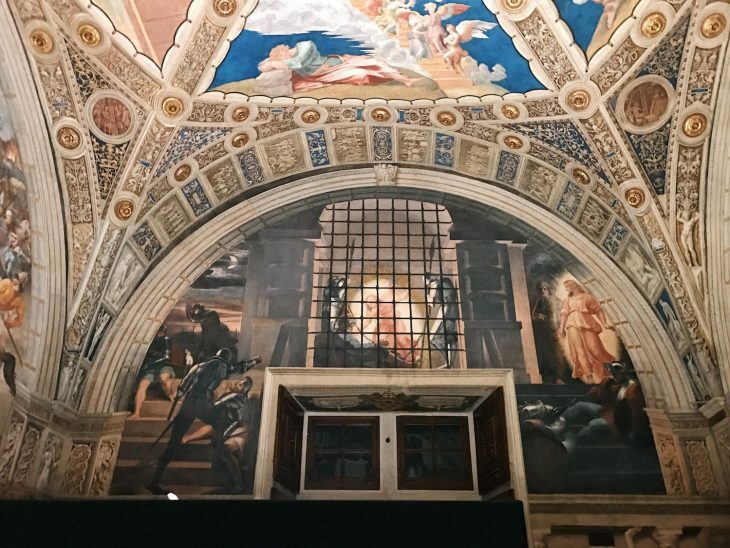 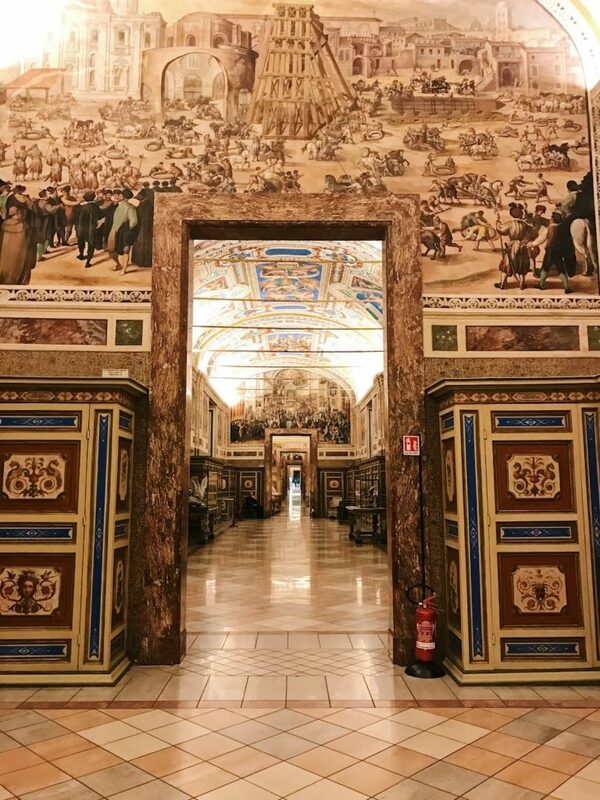 On the 13th of November 2018 we had the honor to attend the presentation of the major book disclosing the recent restoration works performed on Raffaello’s frescoes at the Vatican Stanze, entitled “Raffaello a Roma. 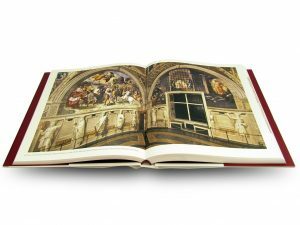 Restauri e ricerche”, edited by Antonio Paolucci, Barbara Agosti, Silvia Ginzburg. 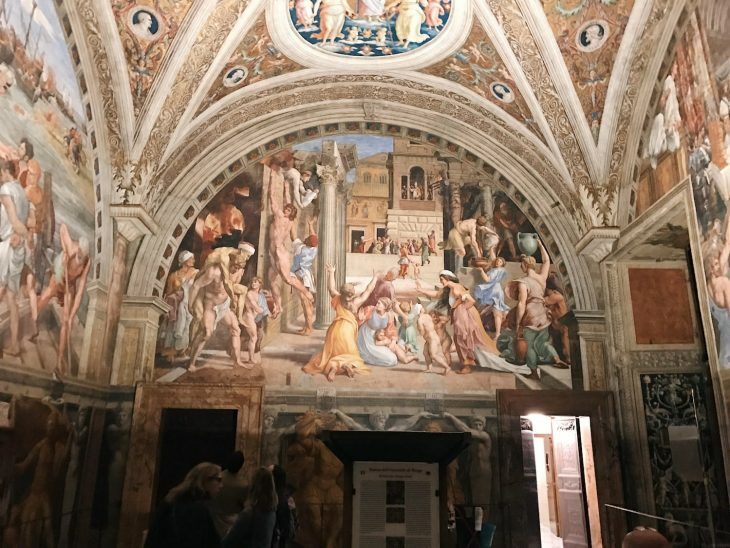 Illustrious authors, art historians and scholars attended the conference at the Sala Conferenze inside the Vatican Museums. 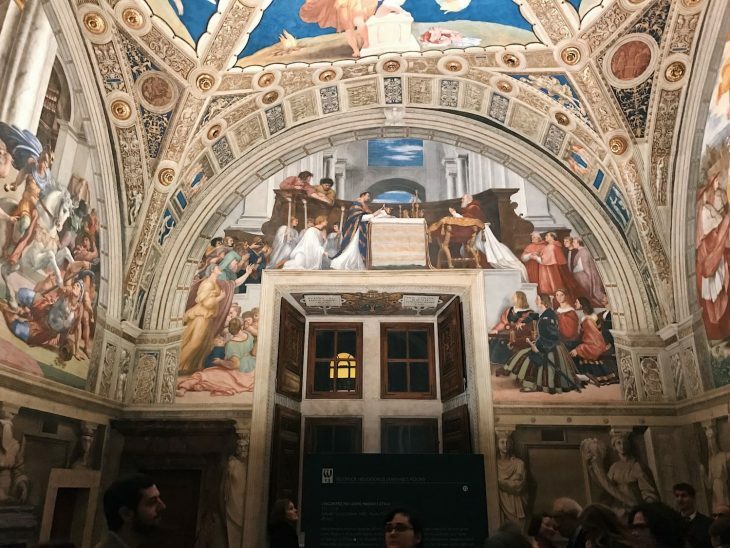 The speech of curator Guido Cornini on the occasion of the "Raffaello a Roma. 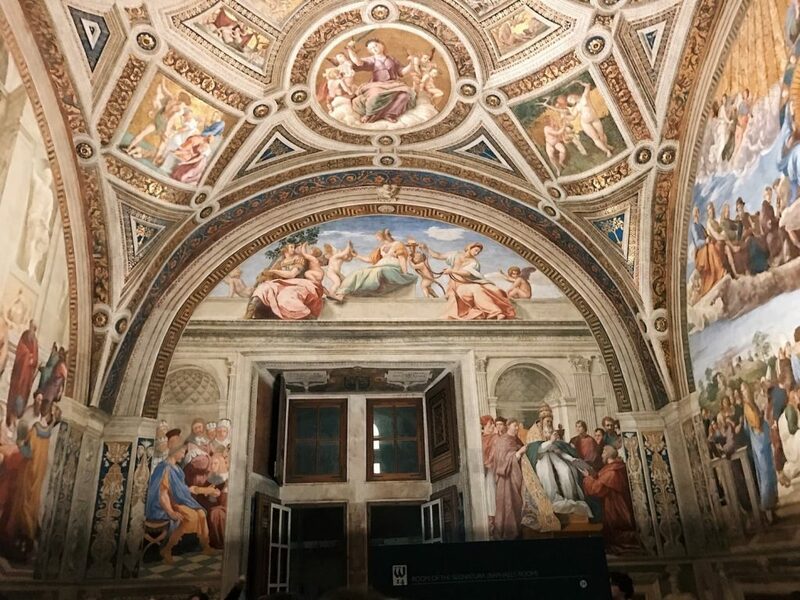 Restauri e ricerche" book presentation at the Vatican Museums, Sala Conferenze, 13 November 2018. Raffaello Sanzio and helpers, The Mass at Bolsena (detail), Stanza di Eliodoro, fresco painting, ca. 1512, Vatican Museums. 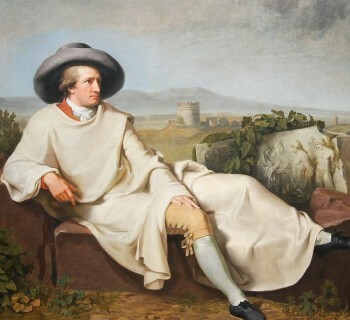 Second event we had the chance to attend after the inauguration of the exhibition “Winckelmann. 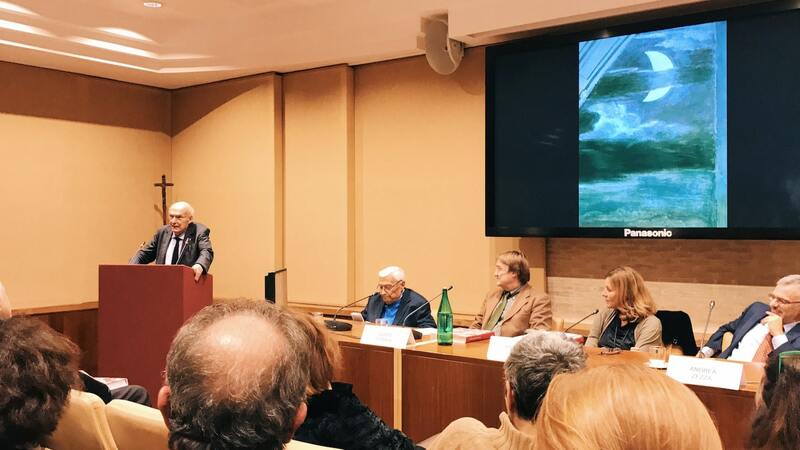 Capolavori diffusi nei Musei Vaticani”, this presentation was opened by a speech of Barbara Jatta, the director of the Vatican Museums, followed by the curator of 15th-16th art Guido Cornini and professor Andrea Zezza, from the Università degli Studi della Campania “Luigi Vanvitelli”. 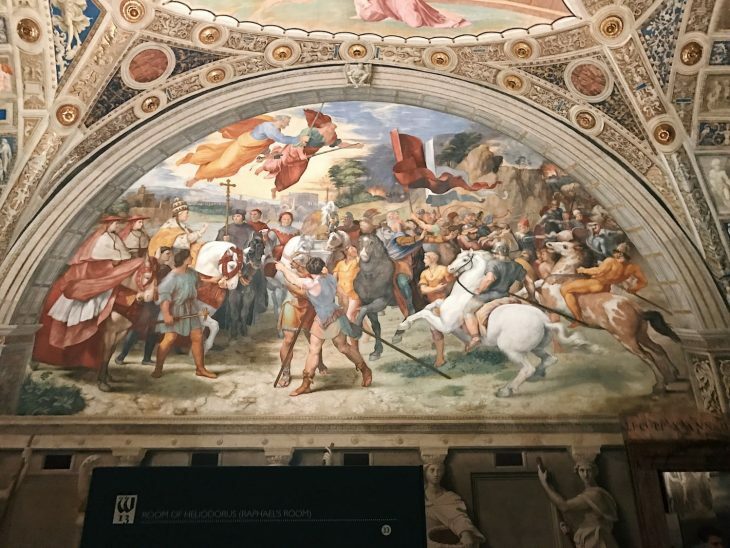 Title: "Raffaello a Roma. 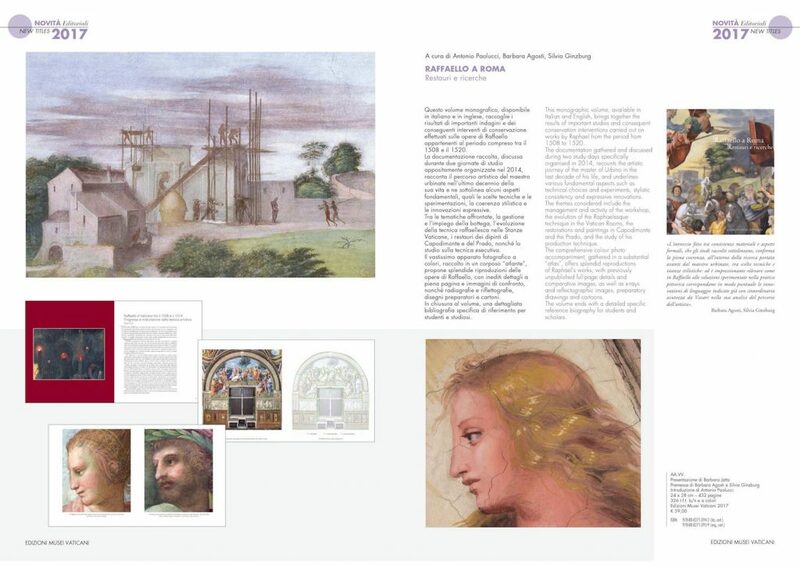 Restauri e ricerche", edited by Antonio Paolucci, Barbara Agosti, Silvia Ginzburg, Edizioni Musei Vaticani, 2018. 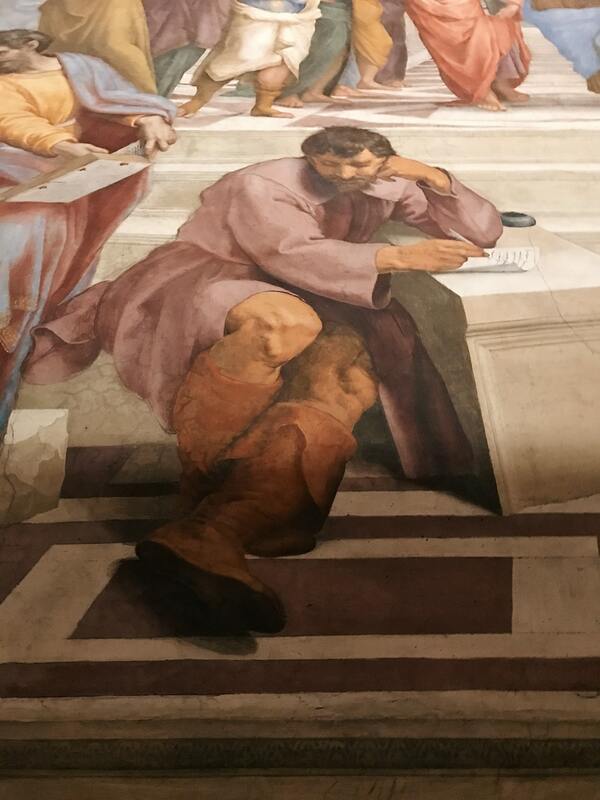 «The close interweaving between material qualities and formal aspects, which is underlined by the essays collected here, confirms the strong coherence between technical choices and stylistic outcomes in the creative research conducted by the master from Urbino: and it is striking to see how the experimental solutions in Raphael’s practice as a painter correspond precisely to the stylistic innovations already pointed out with extraordinary acuteness by Vasari in his analysis of the artist’s development». A fascinating speech by the charismatic Antonio Paolucci, former director of the Vatican Museums, payed homage the present participants, in particular the renowned art historian Arnold Nasselrath, the restorer Paolo Violini who directed the restoration works at Raffaello’s Stanze since 1997 (and illustrated new acquisitions on Raffaello's painting technique in 2016 at Palazzo Venezia courtyard) and the professor Michela di Macco from Sapienza University, who figured among the authors of the presented book. Raffaello Sanzio and helpers, The School of Athens (detail), Stanza della Segnatura, fresco painting, ca. 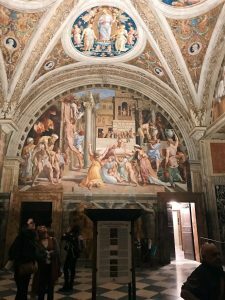 1509-1511, Vatican Museums. Antonio Paolucci also exceptionally unveiled for this year 2019 the preparations of an extraordinary initiative to be organized at the Vatican Museums for the following 2020, in order to commemorate the 500th year anniversary since Raffaello’s premature death in Rome on the 6th of april 1520, at the age of 37: the surprising set-up of the tapestries designed by Raffaello and executed by Pieter van Aelst’s workshop in the historical location where they were originally destined, that is on the painted walls of the majestic Sistine Chapel, so to evoke the night of the 26th December 1519 when the complete series of tapestries was displayed raising the wonder of the lucky witnesses. 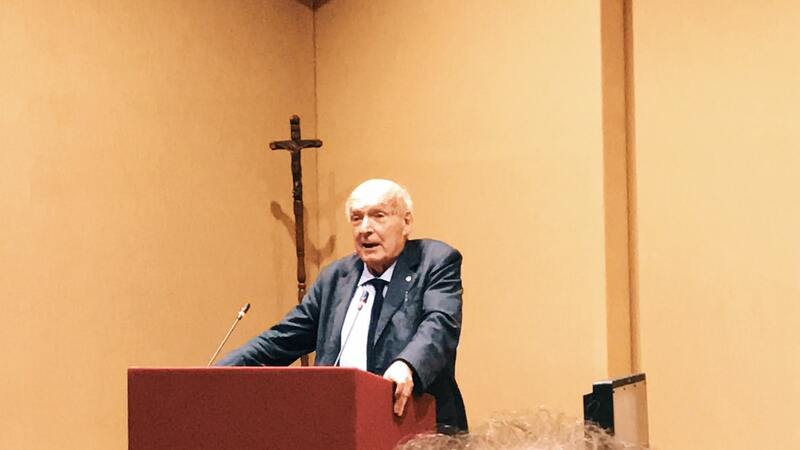 The speech of Antonio Paolucci on the occasion of the "Raffaello a Roma. 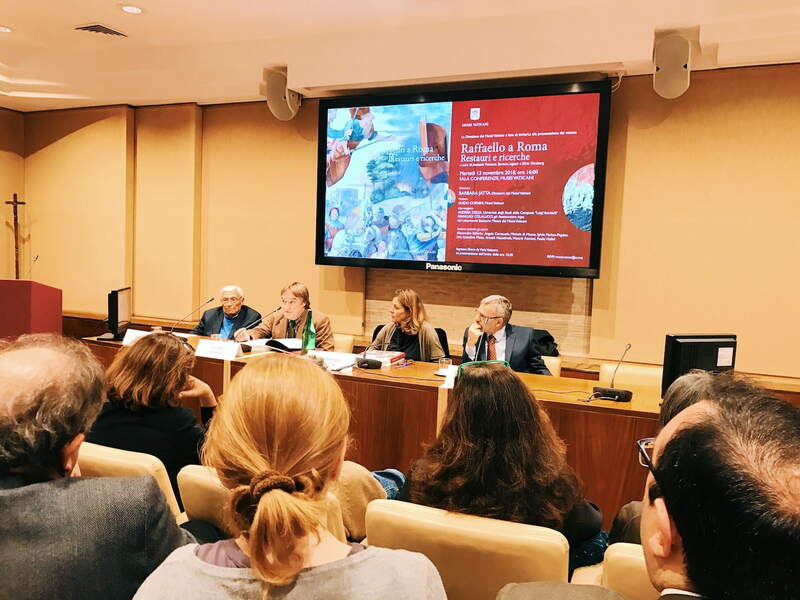 Restauri e ricerche" book presentation at the Vatican Museums, Sala Conferenze, 13 November 2018. 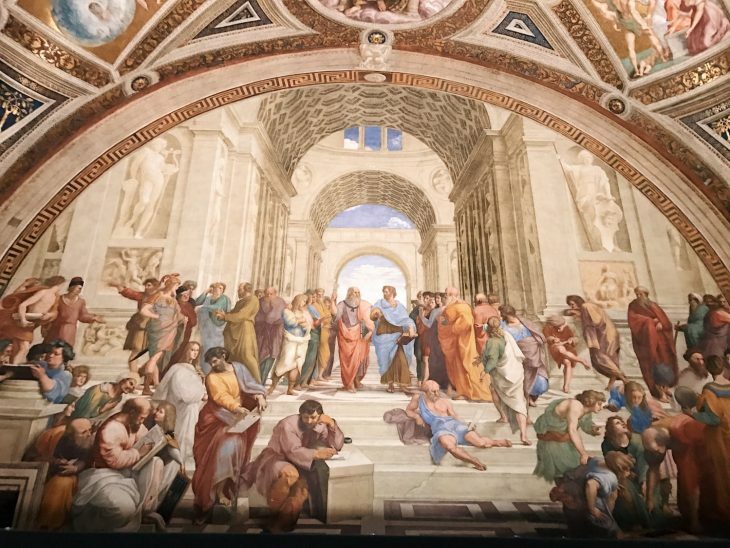 The eminent Gianluigi Colalucci, chief restorer of Michelangelo’s frescoes at the Sistine Chapel, took part in the discussion, telling unprecedented anecdotes about his compelling experience in direct contact with the surfaces painted by the giant of Renaissance art Michelangelo Buonarroti. Cover of "Raffaello a Roma. 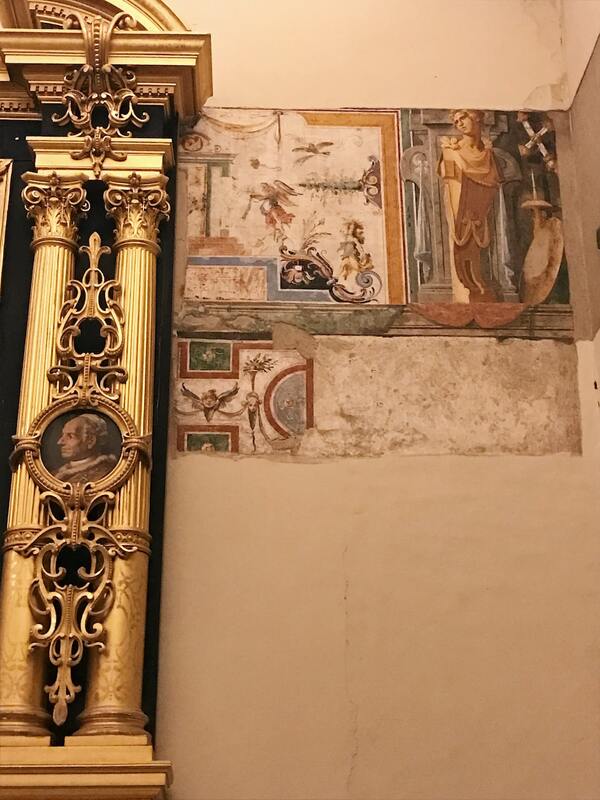 Restauri e ricerche", edited by Antonio Paolucci, Barbara Agosti, Silvia Ginzburg, Edizioni Musei Vaticani, 2018. Interior pages of "Raffaello a Roma. 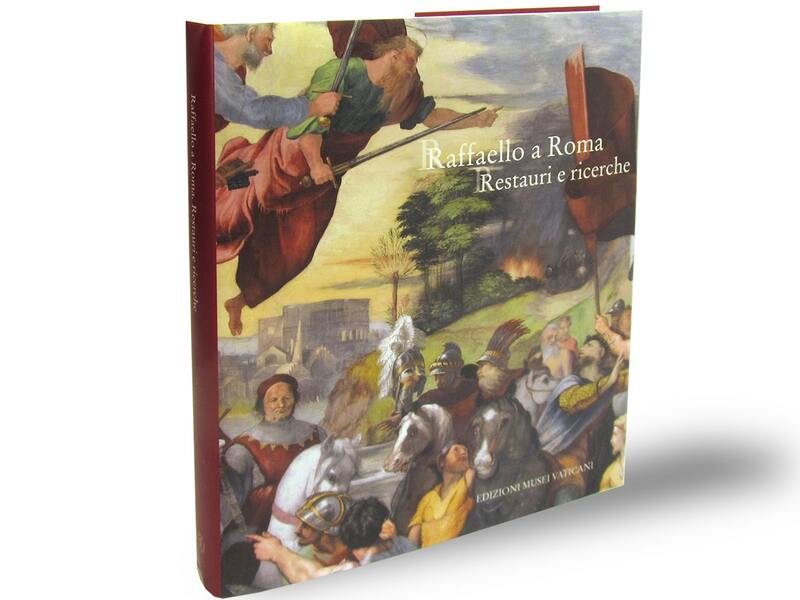 Restauri e ricerche", edited by Antonio Paolucci, Barbara Agosti, Silvia Ginzburg, Edizioni Musei Vaticani, 2018. Presentation of "Raffaello a Roma. Restauri e ricerche", edited by Antonio Paolucci, Barbara Agosti, Silvia Ginzburg, Edizioni Musei Vaticani, 2018. 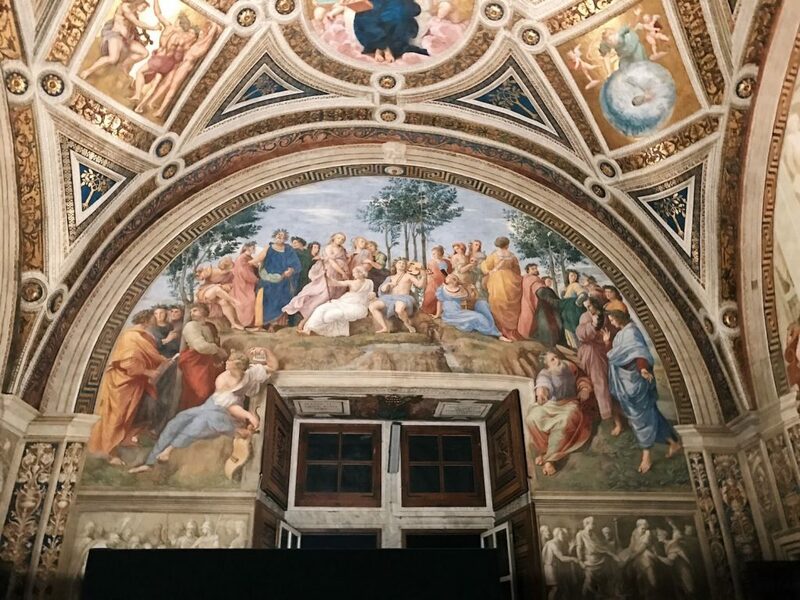 At the end of the event, all the guests of the conference were invited to visit the restored frescoes at the Vatican Stanze and to breath the sublime atmosphere of the Sistine Chapel without any crowds in the evening, perfectly illuminated also after sunset thanks to the presence of approximately 7000 light emitting diodes, setup according to the renovated lighting system. 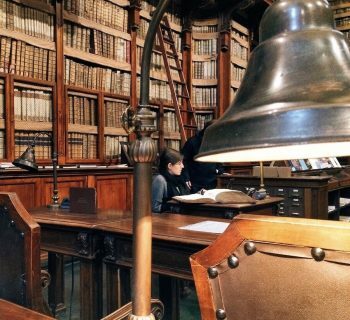 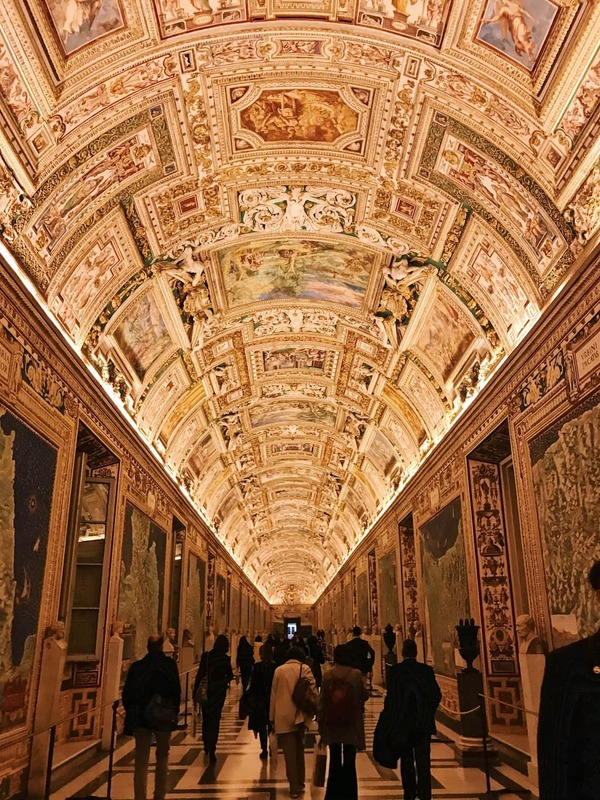 The Galleria delle Carte Geografiche lighten up in the evening at the Vatican Museums. 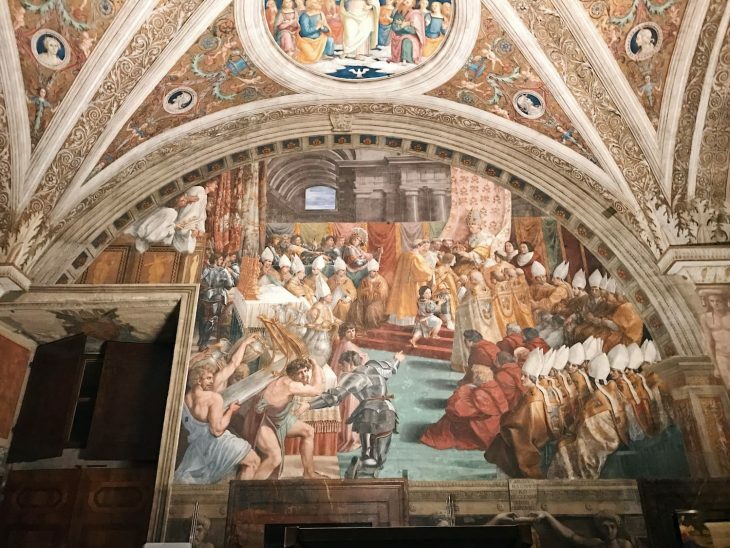 On the walls, forty frescoes depict the Italian regions and the possessions of the Papal State, representing the influential power of the Church. 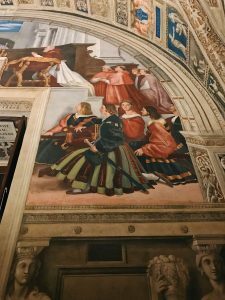 This fresco decoration was commissioned by pope Gregorio XIII between 1580 and 1583 ca. 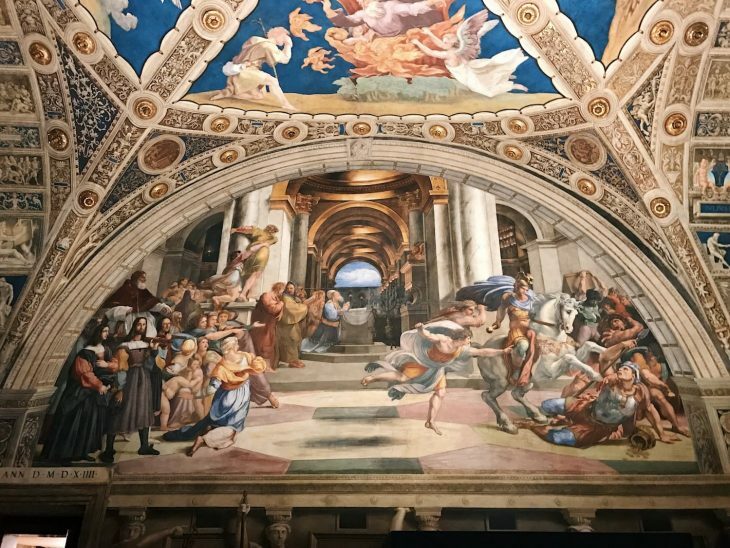 upon the designs by cosmographer Ignazio Danti. Moreover, the vault decoration with stucco and paintings was executed by Girolamo Muziano, Cesare Nebbia and other artists. Cesare Nebbia and Giovanni Guerra, Moving of the Vatican Obelisk in piazza San Pietro in May-September 1586 (detail), fresco painting, 1588-1590, Sale Sistine, Musei della Biblioteca Apostolica Vaticana, Vatican Museums. 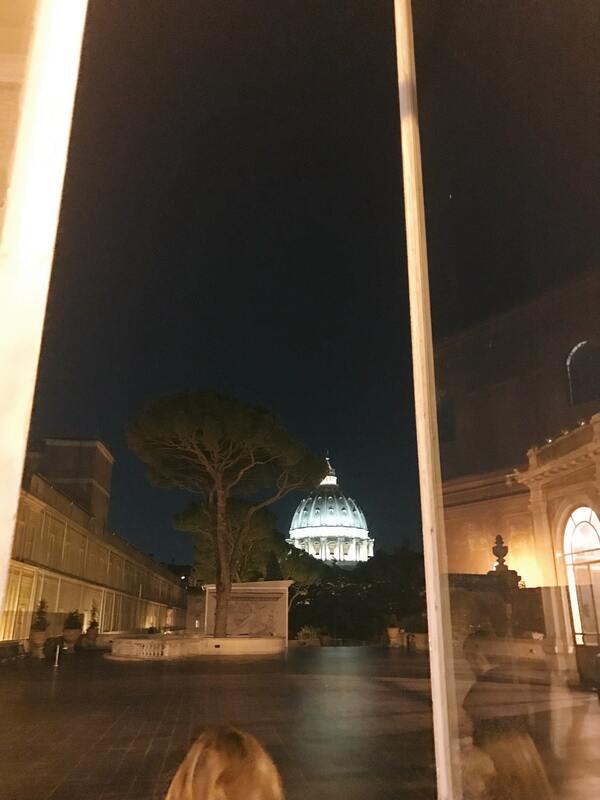 View of St. Peter's dome in the evening from the Vatican Museums. 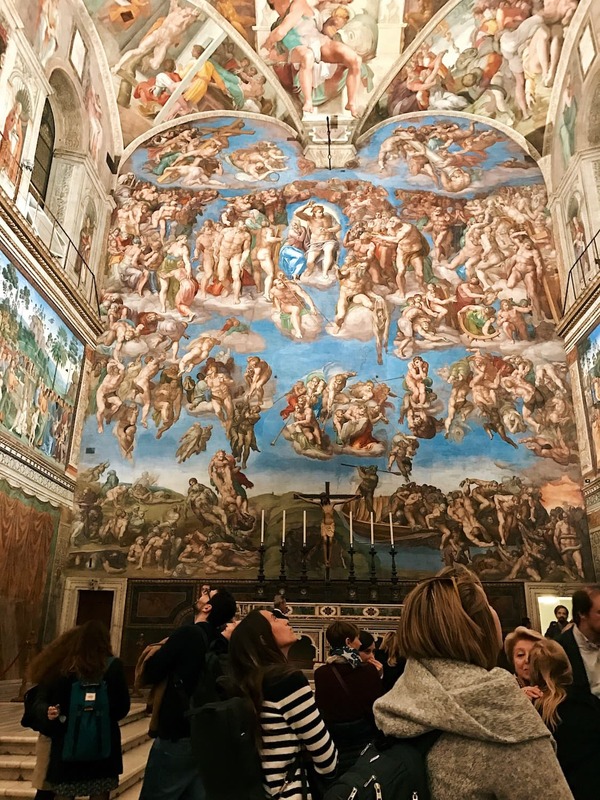 The Sistine Chapel in the evening, Vatican Museums.